2011, 268 p. Extract here . I was drawn to read this book, the first as part of my Australian Women Writers Reading Challenge 2012, through encountering the author previously in her earlier book Coldwater, and by the promise of a book that traversed different settings during World War II- Sydney, London, Shanghai and Singapore. It was ironic then, that the treatment of the breadth of its canvas was what I found to be its weakest feature, even though it was what attracted me in the first place. 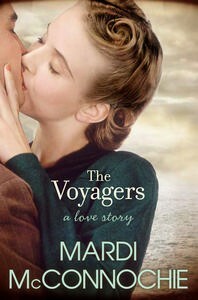 In the opening pages Stead, an American sailor, returns to Sydney in 1943 hoping to spend his leave with Marina, a musician he had taken up with for three days before the war. When he retraces his steps to her home, he finds that she has been missing for almost five years. The book then zig-zags back and forth in time, jumping forward and back, tracing between Marina, then Stead as they traverse their own journeys in a ruptured world, oblivious to each other’s experiences, and gradually honing in on their search for each other. The complexity of this plot was handled well, and I found myself drawn through the book, wanting to know what would happen next and whether they would, eventually, find each other. The strong emphasis on plot means that I am reluctant to say much more, lest I spoil your enjoyment of the book. Yet in making these large leaps from location to location, and event to event, the book at time lapsed into an almost documentary flatness. It was almost as if each new section was introduced by a film-reel summary (think Movietone News) that skated across events, evoking familiarity with images of historical events without actually tying them into the consciousness of her characters. Big things happened, in particular in the final part of the book, and yet they were compressed into a rather disengaged, almost saga-like retelling, tumbling quickly one after the other into an “and then…and then….” string of events. Things happened to Marina especially, but it seemed that it was in the smaller, more intimate events that she seemed more present as a character. It’s interesting that the author has marked out so clearly in the title that this is “a love story”. In an interview about the book with Angela Meyer on the Literary Minded website, the author explains that the book sprang from a discussion with her book group ladies about the paucity of contemporary literary love stories. When I saw this, it explained some of the unease that I felt about it- that it seemed almost written-to-order for a female-dominated bookgroup, raising as it does issues of motherhood, careers, loosening boundaries and the artistic life. It was as if it was writing to a genre or niche. Like the author, I am resistant to the big all-lived-happily-ever-after ending. In this regard, I think that the heightened pace and the emotional distancing in the last third of the book worked against the ending. I did not cry for the Marina we have at the end of the book, but I may have for the Marina we found half-way through. On the other hand, I think that the title and the cover of the book work well as a marketing strategy in that they mark it out as a love story, if that’s the sort of book you’re looking for. But I think of other love stories that I have enjoyed- the same love stories that McConnochie herself identifies in her interview (Cold Mountain, The Shipping News, Possession, Captain Corelli’s Mandolin) and with all of them the love story crept up on me unawares, and I think that I appreciated them all the more for that unexpected delight.